Today’s guest blog post is by Yhu-Hsiung (“Henry”) Lee, MD. 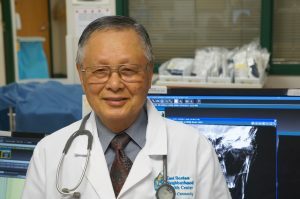 Dr. Lee recently retired as an emergency medicine physician at East Boston Neighborhood Health Center, where he served patients for over four decades. He was also on the staff at Boston Medical Center, Massachusetts General Hospital, and South Shore Hospital, and on the faculty of Harvard Medical School. I never set out to become an emergency medicine physician, let alone to see patients in East Boston’s first emergency room. Nor did I set out to settle in for nearly a half century, serving the diverse medical needs of the people living in a vibrant neighborhood where, not long ago, health care was difficult to access. My path to East Boston started in in Taiwan, where I was born, raised and educated. I came to the United States to gain access to broader educational and professional opportunities as a physician. While trained as an Ear, Nose and Throat specialist, I found my options to enter an ENT residency limited, with few positions for foreign-born doctors. After pediatrics training, I began an infectious disease fellowship at Boston City Hospital – today’s Boston Medical Center. During my fellowship, I met Dr. James Taylor, who was also in the program and had undertaken a study of hypertension in East Boston. When Jim Taylor got to East Boston in the early 1970s, the need for a full-service health center was manifest. At the time, East Boston was a largely working-class Italian neighborhood, geographically isolated from the rest of the city and medically underserved. Lacking a hospital, and separated from vital treatment by lengthy rides on public transit, this five square miles of the city was a veritable medical desert. When East Boston Neighborhood Health Center (EBNHC) began, its two exam rooms had diagnostic tools that seem primitive compared to what exists today: a small lab, simple X-ray machine and an EKG. Today, EBNHC has come a long way. It is equipped with nearly all of the diagnostic equipment found in a hospital. There are 15 exam rooms, surgical rooms, a slit lamp for eye exams, ultrasound, a negative pressure isolation room to treat patients with infectious diseases, a full-service, on-site lab with rapid diagnosis capability, and mental health services. The health center’s emergency department is open 24 hours a day, 7 days a week. It is the only health center in New England, and one of the few in the country, to provide around-the-clock care. The change in East Boston, its health center, and the field of medicine over the course of my career have been dramatic. The one constant has been my love for the profession. Medicine has been richly rewarding to me. It has allowed me to give back to a community in need, to improve the public health, while providing me with a meaningful and deep connection to my adopted homeland. Previous Are you an Essential Community Provider?